1 Kings 6:2 And the house which king Solomon built for the LORD, the length thereof was threescore cubits, and the breadth thereof twenty cubits, and the height thereof was thirty cubits. 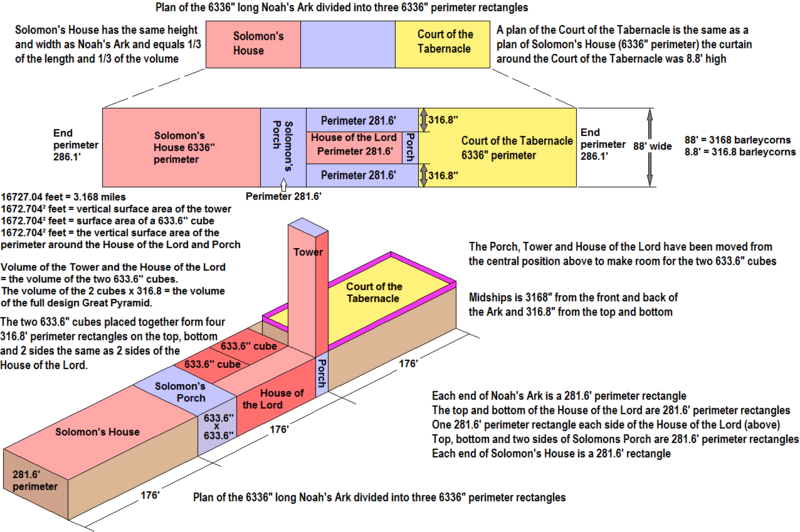 The dimensions above along with other Biblical information inform us that the House of the Lord is comprised of the Holy of Holies (Oracle), the Upper Chamber and the Holy Place, so the Porch and the 3 tiers of chambers around the building are not included when the House of the Lord is referred to. 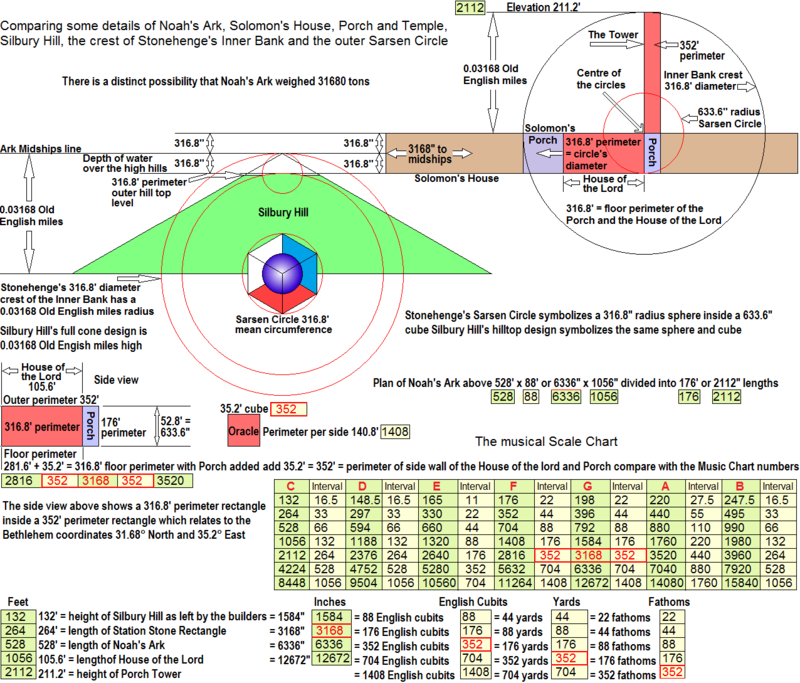 The Bible verse above also provides the necessary information (with the help of other Biblical details) to determine the size and whereabouts of the Upper Chamber and that it is on top of the Holy of Holies (Oracle) and it’s length and breadth are the same as the Oracle and it’s height + the Oracle’s height = the height of the Holy Place. 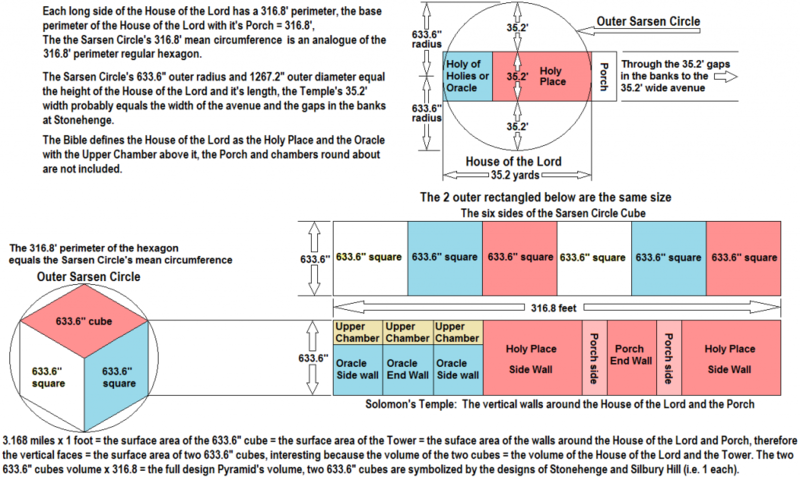 The description of the House of the Lord’s dimensions allows zero thickness for the wall separating the Oracle from the Holy place and zero separation between the Oracle and the Upper Chamber this must be to focus on the spiritual symbolism of the measurements and for some reason the walls do not count. It is important to note that I have drawn the Biblical description and not the actual Temple that was built which would look more pleasing to the eye when the thick walls and pitched roof etc. were included. I believe the cubit referred to in the Bible concerning Solomon’s Temple is the great cubit of 1.76 feet, also I believe the great cubit is referred to in the description of Noah’s Ark, the Tabernacle in the Wilderness, the Ark of the Covenant and Ezekiel’s visionary temple etc. Using the great cubit produces many profound results instead of the mostly meaningless results produced using any of the other versions of the cubit. Jeremiah 32:20 Which hast set signs and wonders in the land of Egypt, even unto this day, and in Israel, and among other men; and hast made thee a name, as at this day. It says God set these signs and wonders which means he was the cause, they are the Great Pyramid (wonder in the land of Egypt), Solomon’s Temple (wonder in Israel) and the wonders among other men refers to the Stonehenge group of monuments there are no other contenders and Stonehenge was already ancient before Jeremiah was born,. It has been thoroughly demonstrated that the designs of the English monuments and the Great Pyramid have the same Source and Solomon’s Temple was also built to God’s specifications. 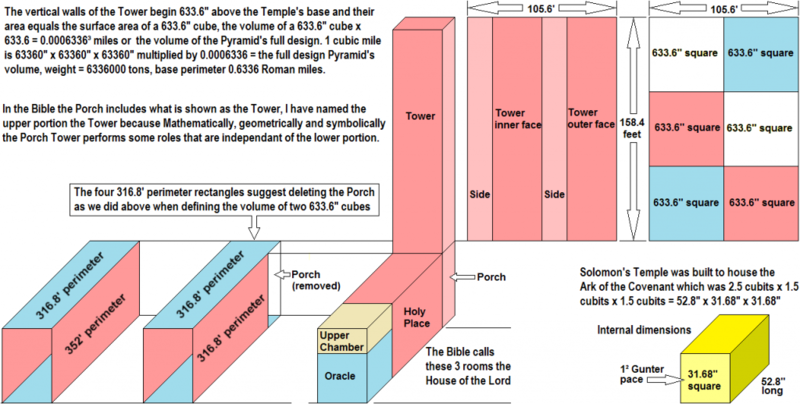 It has been demonstrated how the designs of the English monuments interact with the full design Great Pyramid so we would expect the same concerning the design of Solomon’s Temple and our expectations are not in vain if the cubit referred to in the Bible’s descriptions is the great cubit of 1.76 feet. Ezekiel 40:5 And behold a wall on the outside of the house round about, and in the man’s hand a measuring reed of six cubits long by the cubit and an hand breadth: so he measured the breadth of the building, one reed; and the height, one reed. 2 Ch 3:3 Now these are the things wherein Solomon was instructed for the building of the house of God. The length by cubits after the first measure was threescore cubits, and the breadth twenty cubits. The first time a cubit is mentioned in the Bible is in the measurements of Noah’s Ark predating the reference of any cubit in recorded history, therefore this must be the cubit after the first measure and if this cubit = 1.76 feet then the design of Noah’s Ark also interacts with the design of Solomon’s Temple, Stonehenge, Silbury Hill etc. The Bible says Noah’s Ark was 300 cubits long, 30 cubits high and 50 cubits wide, using the cubit of the first measure a cuubit + a handbreadth i.e. the great cubit of 1.76 feet, the Ark was 528 feet long, 52.8 feet high and 88 feet wide. I believe the Ark was a regular boat shape and the Biblical measurements refer to the symbolism of the usable storage space inside the Ark. The Ark was probably 528’ long and 52.8 feet high but the width would vary, author Jonathan Gray has written a good account of why the remains of Noah’s Ark are a regular boat shape about 138 feet wide and how this relates to the Bible’s 88 feet wide description. The numbers inside boxes are taken from the Musical Scale Chart, the numbers of music are more involved in the designs than is indicated below.